The main hypothesis for why low-carb diets are so effective for weight loss is that they reduce insulin levels (read post). I introduce below a couple of ideas that back the “insulin hypothesis” up. The defining characteristic of type-1 diabetes is that the pancreas can’t create insulin. Before the treatment with insulin starts, there is a remarkable loss of weight. This was typical of this disease before insulin started to be used as a treatment. As an example, if you destroy the cells that create the insulin in rats, their capacity to synthesize fat fails. On the other hand, type-2 diabetes is characterized by insulin resistance. The body does generate insulin but this insulin is not as effective as it should be and this people need more insulin than a healthy person to reduce their glucose in blood to normal levels. This diabetics are usually overweight/obese. Example: some dogs were injected with insulin and an increase of fat synthesis and/or deposition was observed in the zone were it was injected, compared with a zone were a sterile saline solution was injected. The difference between those zones was bigger in dogs with elevated blood glucose (those with pancreas’ cells destroyed using the same drug that they used in the referred rat experiment). Just a final curiosity: pay a visit to this page and see for yourself the effect of 31 years of insulin injections, all on the same area of the body. That image tells us more than any explanation. The “insulin hypothesis” has an explanation for the real fattening, the one that takes place at a cellular level. The “Calories In – Calories OUT hypothesis” (CICO) can’t explain how the energy balance determines the release or synthesis of fat in the adipocytes. 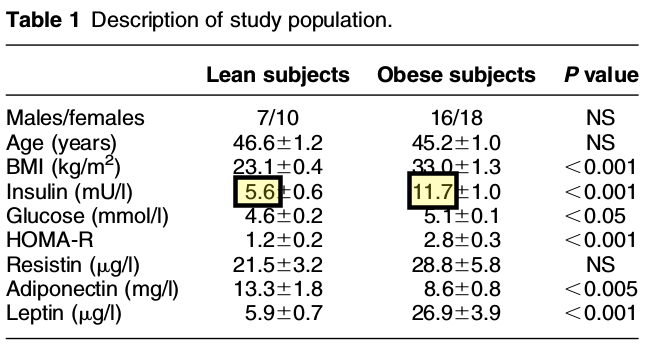 Dietary approaches coherent with the “insulin hypothesis” have consistently proven their effectiveness for weight loss. Dietary guidelines based on the CICO hypothesis have created obesity and diabetes epidemics.